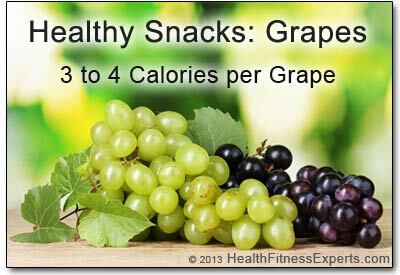 They’re a healthy snack, but how many calories are in grapes? About 3 to 4 calories per grape. So go ahead and eat some! Grapes are a tasty, healthy snack, with about 3 or 4 calories in each grape. But while there are few calories in grapes, you do need to pick them carefully and watch out for pesticides. Read our tips below. Since they are mostly water, grapes do a good job of making you feel full so you won’t eat too many calories. Red, green and most common varieties of grapes have about the same number of calories — the color of the grape does not make a difference. However, if you eat canned grapes, you should make sure the grapes are canned in water. Grapes canned in syrup have a lot of added sugar and double the calories. See the chart below for details on grape calories and basic nutrition information for various types of grapes. Thompson green and red grapes are the most common grapes you’ll find in the grocery store. They originated in Europe, although if you buy them in the United States, they were probably grown in California. You may also find Concord grapes. This variety originated in Concord, Massachusetts in the northeastern United States. They are also known as slip skin grapes because their skin slips off very easily. They are often used for making grape jelly. Muscadine grapes are native to the southwestern United States. They have a pretty thick skin and can sometimes be difficult to eat raw. When selecting grapes in the grocery store, they should be plump, firm, and securely attached to the stems. Avoid grapes that are wrinkled or leaking juice. The stems should also look healthy, and the connection point to the stems should be the same color as the rest of the grape. If you are want the grapes to be sweet, look for green grapes with a slightly yellowish color, red grapes that are uniformly red, or black grapes that are dark with a rich hue. Grapes are a healthy snack. They are a good source of antioxidants, which are naturally occurring plant compounds that research scientists believe help prevent disease (like cancer), fight aging, and improve cardiovascular health. Grapes are number 7 on the Environmental Working Group’s “Dirty Dozen Plus” list of the most pesticide contaminated fruits and vegetables. So you may want to buy organically grown grapes. If you do buy conventionally grown grapes, be sure to always wash them very thoroughly before eating them! Frozen grapes are a fun and healthy snack on a hot day. They are particularly popular with kids. For best results, pluck the grapes and be sure to thoroughly wash and then thoroughly dry them. Spread them out on a cookie sheet or otherwise separate them before you put them in the freezer — that will help prevent you from getting big frozen clump of grapes. Once they are frozen solid, you can take them off the cookie sheet and store them in a plastic freezer bag. Then pop them out for a yummy, frozen snack. Grapes are always a healthy choice. They make a great desert or healthy snack between meals. And cold or frozen grapes will cool you off on a hot day and help keep you hydrated. So go get some and enjoy! Do you like grapes? What’s your favorite variety? How do you like to eat them? Share your thoughts by leaving a comment below. We’d love to hear from you! Washington, DC: Environmental Working Group.